Inner City Press: Helen Clark, UN system official, head of UNDP, is listed on the website of Socialist International, which is meeting here at the UN, as a vice-president of the organization. I’m just wondering, was, is there some kind of waiver given or is permissible for a UN system official to serve in such a capacity with an outside group? Spokesperson Nesirky: I would ask you to ask UNDP. Inner City Press: Right, okay. After the briefing, the UNDP communications officials said to Inner City Press, you're known for this type of question. He then asked why Inner City Press didn't direct the question to Helen's people. But aren't you all Helen's people? Another UNDP communications official said, in the briefing room and later by voice mail, that Helen's people would get back to Inner City Press with an answer. Two full days later, there still was been no answer. Where were and are Helen's people? Watch this site. Update: after preparation of this article, Inner City Press received an answer by asking, not UNDP again, but... Nesirky again. It is not clear why UNDP never responded to Inner City Press. 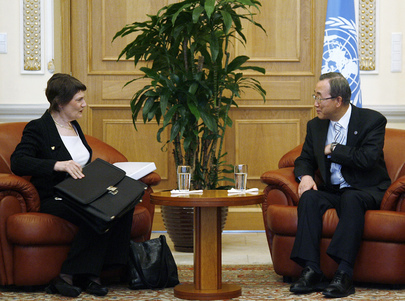 Nesirky said that Helen Clark's role as Vice President of the Socialist International was only as prime minister of New Zealand. Nesirky said Socialist International has now been asked to remove her name from its web site. But SI has as VP a number of politicians out of power, meaning that removal from the VP board is not automatic. 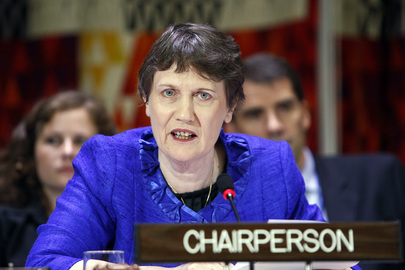 Did Helen Clark make the request when she took the UN job? Or only now?